Freeman has imported 26 bee hives from Arkansas to his Mississippi ranch, where he has planted bee-friendly plants, including lavender, clover and magnolia trees, according to Forbes. The Oscar winner first discussed his beekeeping hobby in 2014 on "The Tonight Show Starring Jimmy Fallon." 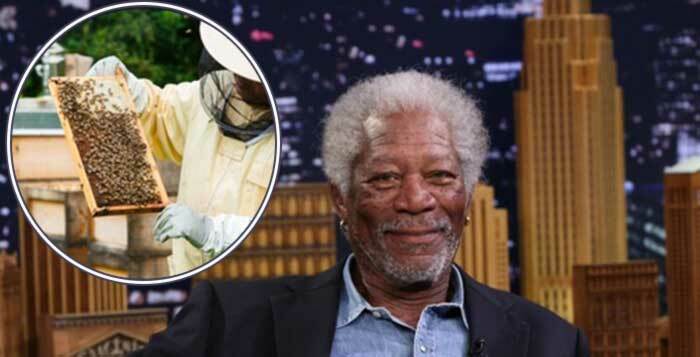 "I've discovered I don't have to put on a bee suit or anything to feed them," Morgan said in the 2014 interview. "I've never been stung. I'm never gonna get stung." "There’s been a frightening loss of bee colonies, particularly in this county," Freeman said in another interview with Larry King. "To such an extent that the scientists are now saying, 'This is dangerous.'" Freeman's hobby comes as bees face declining numbers across the globe. A 2016 survey supported by the Department of Agriculture revealed that between April 2015 and April 2016, beekeepers lost nearly half their colonies. Such reports have led to criticism of pesticides used in farming. In August, the Interior Department announced it would reverse an Obama-era rule banning pesticides that threatened bees and butterflies, as well as other pollinators, and wildlife such as birds. Call it “The Buzzing Dead.” Infestations of what scientists have dubbed “zombie bees” have spread across both the West and East coasts in recent years. The honeybee hordes, while not actually undead, are the unwilling hosts to a parasite infection that researchers think drives the drones to act erratically, or “zombielike,” in the moments before they die. To better understand the parasitized swarms, John Hafernik, an entomologist at San Francisco State University has recruited people countrywide to join his hunt. “The big question for us was, ‘Is this a San Francisco thing?’ Or something that is taking place all over the country that has not been noticed by biologists before,” he said. Since he began the project four years ago, he has concluded the answer is the latter. Volunteers have helped identify infected honeybees in California, Washington and Oregon as well as Vermont, Pennsylvania and New York. More than 800 bee observations have been uploaded to the ZomBee Watch online database. Dr. Hafernik first discovered something eerie was happening to the bees on his campus in 2008 when he stumbled upon several of them staggering in circles along the sidewalk. For weeks he picked a few up and placed them in a glass vial with plans to feed them to his pet praying mantis. One day he came across a vial he had forgotten on his desk for a couple of weeks. The bees inside were dead, but the vial was overwhelmed with small brown fly pupae. He came to the realization that the bees were parasitized. After further exploration across San Francisco Bay, he and his colleagues found several bees that were also behaving strangely. They would fly from their hives at night, which was something bees would normally never do, and then circle around a light fixture. After their nocturnal dance the bees would drop to the ground and start walking strangely. They were succumbing to their overlord, larvae of the fly Apocephalus borealis. The life cycle of the parasitic fly is straight from a horror story. The female fly uses something called an ovipositor, which is like a hypodermic needle, to inject her eggs into the abdomen of the honeybee. About a week later the larvae lurking within the abdomen wriggle into the bee’s thorax and start liquefying and devouring its wing muscles. Then, like in the movie “Alien,” they burst through the bee’s body, erupting from the soft space between its head and shoulder area. As many as 80 percent of the hives that Dr. Hafernik examined in San Francisco Bay had been infected. Understanding more about how the infection spreads is important, he said, because although the infestations are not the main driver behind honeybee declines across the country, they could help collapse an already vulnerable colony. Learn about Beekeeping for FREE!